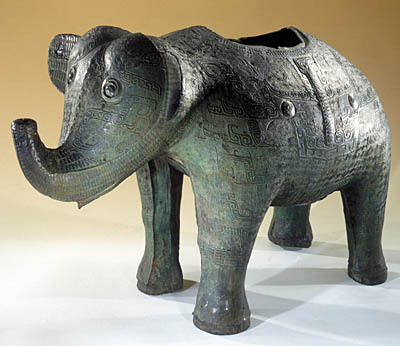 Despite its monumental appearance, this standing elephant with its raised trunk is in fact a recipient, the hollow interior of was filled from a square opening on the animal’s back (the lid is now missing). On each flank, the long ribboned bas relief taotie ornamentation is submerged in a background of leiwen. Scales that extend as far as the ears, trunk, belly and feet have replaced these emphatically set back motifs. In places, the surface has been left smooth in order to highlight the mass. The pronounced zoomorphic volume and diminished ornamentation are characteristic of Southern Chinese production in Hunan. There, a determined spirit of regional autonomy developed at the expense of the conventions in force in the capital Anyang in Henan. Such visual features may well ultimately have influenced official northern productions, as illustrated by a jade elephant discovered in lady Fuhao’s tomb. This type of piece derived its form from the art of the potters and its ornamental decoration from that of the jade carvers. It was cast in a mould containing fire-clay sections. The intersection between the different compartments left distinct residual ridges running along the feet and abdomen of the animal. The generic term zun designates wine vessels that vary in shape from the simple chalice to more zoomorphic forms. As the master of official religious rites, the monarch paid tribute to heaven for the harmonious functioning of the universe. The Shang understood the magic potential of such sacrificial vessels cast in a rare material, and bronze sacrificial vases soon came to symbolize royal legitimacy. For this reason, an extremely wide variety of forms emerged in all fifty models reflecting the sumptuous nature of such rituals.